Lava is melted rock that has reached the Earth's surface through a volcano 's main vent or through side vents and fissures . Some volcanoes produce little or no lava. Some volcanoes eject pyroclasts, which are fragmented or broken rock. The word pyroclastic comes from a Greek word that means "Rock broken by fire". When volcanoes do produce lava flows they are classified as either Pahoehoe or Aa. The lava is identical in both pahoehoe and aa lava flows, the difference comes from the amount of lava erupted and the speed of cooling. Pahoehoe lava flows are produced from a small amount of lava that moves slowly, while aa flows usually are associated with a large volume of lava that moves swiftly. Aa flows are generally 6-15 feet thick and pahoehoe flows are usually 1-3 feet thick. If the lava is very hot and has a low viscosity (runny with a low gas and silica content) the lava flow is called Pahoehoe. If, on the other hand, the lava has a high viscosity (thick and pasty with a high gas and silica content) it is called Aa. Silica is a white or colorless crystal that is present in sand and quartz. 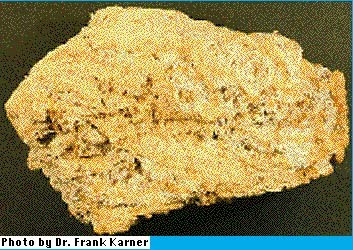 It is one of the most abundant compounds in the Earth's crust. 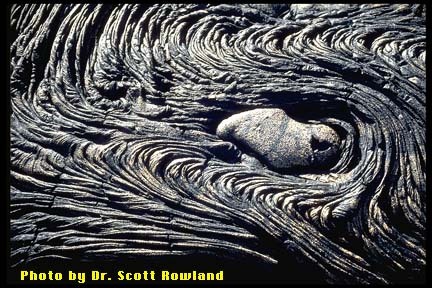 The photograph shows a pahoehoe flow on the left and an aa flow on the right. 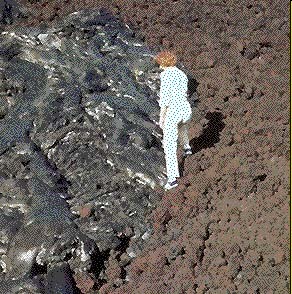 Pahoehoe (Pa-Hoy-Hoy) lava flows are very hot, thin and runny. When it cools is has a smooth to ropey texture because of the low silica content which makes it cool quickly. Pahoehoe flows creep along generally at less than 3 feet per minute but some flows have been measured at over 20 miles per hour. The terms pahoehoe and aa are from the native Hawaiian language and are now used by geologists the world over. This pahoehoe flow is advancing on the skeleton of a large mammal perhaps a horse or a cow. 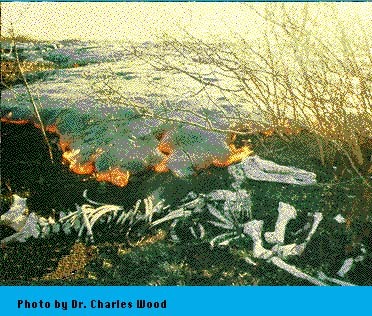 The lava will engulf the animal and may fossilize the remains!! Notice how the flow advances in globs of lava. These globs of lava are called lobes. 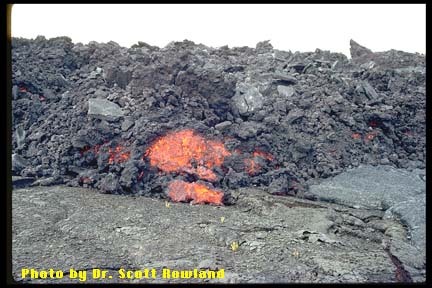 Aa lava flows are formed when the lava is produced in a manner that allows it to cool quickly. When a fire fountain shoots the lava high into the air it cools somewhat before it can flow after landing on the surface. Aa lava also forms when there is a huge amount of lava produced or a steep slope moves the lava at high speeds. These high speeds put the lava in greater contact with the air, which makes it cool more quickly. Notice the rough and fragmented upper surface of the photo at the left. Would you like to walk barefoot on this after it cools? A pahoehoe lava flow produced the lava tube in the picture above. A lava tube forms when the lava on the outer surface of the flow cools much faster than the inside of the flow. The outside becomes cooled hardened lava rock while the inside stays molten and also keeps flowing. If something happens to stop the flowing lava there will be nothing to fill the void and a tube is the result. No, this is not a North Dakota blizzard. This photo is showing the ash fall from Mt. Pinatubo's (Phillipines) eruption in 1992. Many inches of ash fell and the U.S. Naval and Air Force bases near the mountain were closed because of the eruption. When Mt. St. Helens erupted in 1980 the ash cloud rose to an altitude of over 50,000 feet, that is almost 10 miles high! The mountain kept spewing ash for another nine hours on May 18th. The ash deposits were many inches deep in many cities in Washington. This ash choked humans and animals. People were forced to wear gas masks so they could go outside of their homes. Pyroclasts are particles that are ejected during a volcanic eruption. They range in size from very small particles called dust to ash (1/10 of an inch) to lapilli ("little stones" 1/10 of an inch to 2 inches ) to the largest of the pyroclasts, blocks and bombs (2 inches to many feet in diameter). Volcanic Ash is any very fine grained material erupted from a volcano that is less than 1/10 of an inch (2 millimeters) in diameter. This is very fine material and was given the name ash because it resembles ashes from the burning of wood or coal. Volcanic ash is rock that has been exploded and shattered by steam inside the volcano. Ash and lava flows build stratovolcanoes into mountains with repeated eruptions. Pyroclastic flows are spinning mixtures of pyroclasts (small pieces of obsidian , ash, pumice , and cinders) and very hot gases. They flow down the side of the volcano at speeds up to 100 miles per hour and at temperatures sometimes over 700 degrees Fahrenheit!! With temperatures that high pyroclastic flows kill everything it their path. There were two pyroclastic flows from Mt. St. Helens main eruption in 1980. The first flow was called the "stone wind" and it annihilated everything in its path. Huge trees over one hundred feet tall were snappped and splintered like twigs. Temperatures of over 700 degrees ate up all the oxygen in the area. All animal life in its path was destroyed in seconds including 57 humans. Later in the day another pyroclastic flow piled pumice and ash in thick deposits for many miles around the mountain. The photo above is a pyroclastic flow down the north flank of Mt. St. Helens. Pumice is a very light colored, frothy volcanic rock. Pumice is formed from lava that is full of gas. The lava is ejected and shot through the air during an eruption. As the lava hurtles through the air it cools and the gases escape leaving the rock full of holes. Bombs and blocks are the largest of the pyroclasts. Blocks are angular chunks of rock that has been ejected from a volcano during an eruption. 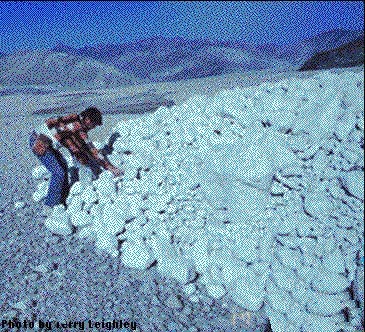 The photo above is of a geologist studying pumice blocks from the May 18, 1980 eruption of Mt. St. Helens. A bomb is formed as lava hurtles through the air, cooling and forming a hardened lava rock. A bomb's shape is usually more rounded or streamlined. Notice the teardrop shape of the bombs. Obsidian is a very shiny natural volcanic glass. When obsidian breaks it fractures with a distinct conchoidal fracture. Notice in the photo to the left how it fractures. 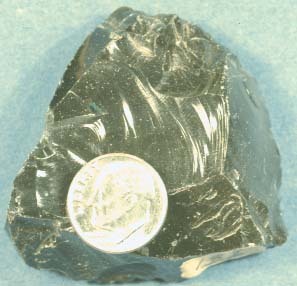 Obsidian is produced when lava cools very quickly. The lava cools so quickly tht no crystals can form. 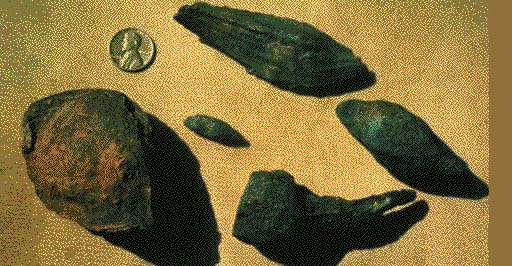 Ancient people throughout the world have used obsidian for arrowheads, knives, spearheads, and cutting tools of all kinds. Today, obsidian is used as a scapel by doctors in very sensitive eye operations. Write the answers to the following questions in complete sentences on a piece of paper. Use the page titles located directly under the questions to move your way through the lesson to locate the answers. When you have finished the questions click on the Earth icon to return to the start of the lesson. 1. Describe pahoehoe and aa lava flows. 2. What is a pyroclast and how do they form? The photo above is of Mt. St. Helens today. This once beautiful mountain was changed dramatically on May 18, 1980. The eruption that occurred was a Plinian eruption, which is the most violent eruption classification. As you learned in the last lesson, different magmas have varying amounts of silica and gas that cause the lava to either be thick and pasty or thin and runny. The thickness and thinness of the magma will determine how a volcano will erupt and what kind of a cone will form. 1. The magma deep under the crust is less dense than the surrounding rock causing it to rise. 2. As the magma approaches the surface of the Earth the gas that is in the magma will come bubbling out because the pressure surrounding the magma will decrease nearer the surface. Have you ever had a can of soda pop explode all over the room? This "eruption" of pop is caused by the same scientific principle that causes a volcano to erupt violently. When you open the pop can the pressure is released so quickly that the gas that is dissolved in the pop comes rushing out along with some of the pop. Volcanoes are classified by the eruption type and by the volcanic cone shape. 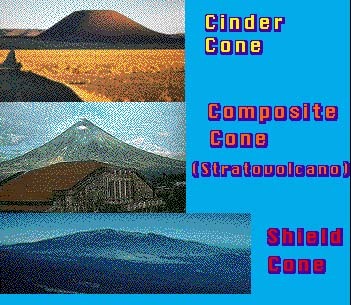 There are three basic cone shapes and six eruption types. The three cone shapes are cinder cones, shield cones, and composite cones or stratovolcanoes. 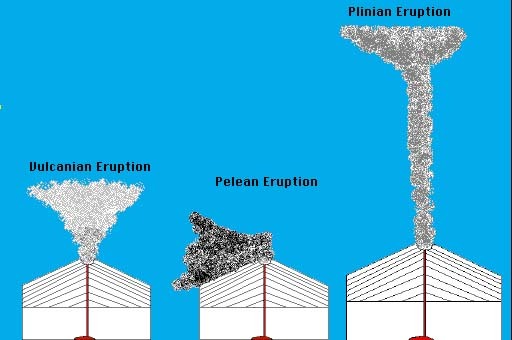 The six eruption types are in order from least explosive to the most explosive; Icelandic, Hawaiian, Strombolian , Vulcanian , Pelean, and Plinian. Notice how, as the eruptions become more violent, the cone shapes become more steeply constructed. You will read about these volcanic types in more depth later in the lesson. 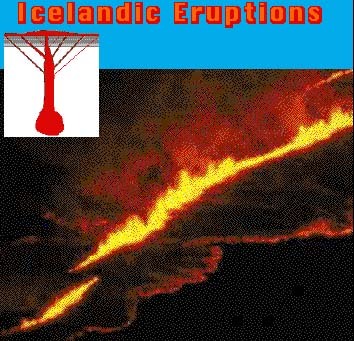 Icelandic, flood, or fissure eruptions are all terms for volcanic eruptions that flood the surface of the Earth with massive amounts of very hot, very thin, runny lava. The lava comes out of the ground through long cracks in the surface called fissures . Some of these fissures can be up to 15 miles long. The type of cone produced from icelandic eruptions is a shield cone. Shield cones are very low and very broad shaped volcanoes. These volcanoes erupt many times over the same area forming huge, and thick lava plateaus. The Deccan Plateau of India was formed this way and covers 100,000 square miles (A little smaller than the state of Montana). The Columbia Plateau of the western United States is the largest lava plateau in the world. It covers almost 100,000 square miles and is almost a mile thick in places. The photo above is of Krafla Volcano on the island of Iceland. Hawaiian eruptions are similar to Icelandic eruptions because both eruption types have many fissures bringing the lava to the surface. Both types of eruptions are known for their beautiful fire fountains like the one shown above. 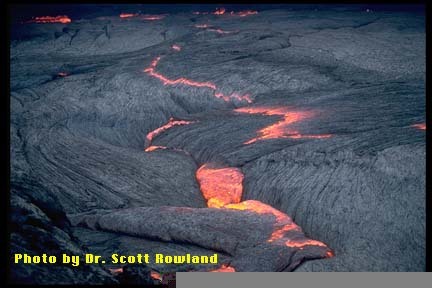 The lava that flows from both types of eruptions is very hot, thin, and runny which allows for fast flowing lava flows. The main difference lies in the fact that most Hawaiian eruptions have the greatest quantity of lava pouring out of the main vent at the volcano's summit, not along side fissures. These summit eruptions build the cone steeper and higher. The volcano above was formed from Hawaiian eruptions. Shield cones were named by Icelandic people because the cone's shape reminded them of a warriors shield layed down. Shield cones form from hot, runny lava that is erupted from the the volcano through its summit and the many side vents and fissures throughout the volcano's flanks (Sides). Shield cones are low, very broad, and gently sloping volcanoes. The volcano pictured above is Mauna Kea, which is located on the big island of Hawaii. Mauna Loa, which is also on the big island, is the largest volcano on Earth and the tallest mountain in the world if measured from the floor of the ocean where it was formed. Mauna Loa is 13,677 feet above sea level but over 17,000 feet of mountain lies under the water. This volcanic mountain is over 30,000 feet tall from sea floor to the summit. 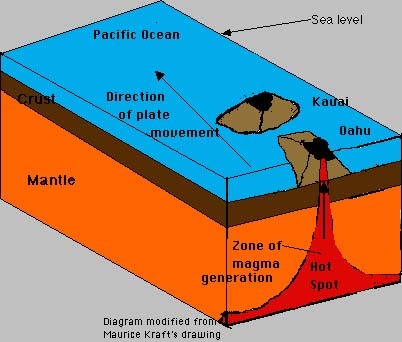 Maua Loa started to form above the Hawaiian hot spot about one million years ago and broke the surface of the ocean about 500,000 years ago. Strombolian and Vulcanian eruptions are more explosive than Icelandic and Hawaiian eruptions. Strombolian eruptions are named for the volcanic island off of the coast of Italy. Stromboli has erupted over many centuries almost constantly. Stromboli has been named the "Lighthouse of the Mediterranean" because it erupts every 20 minutes or so. Strombolian eruptions are short lived explosive eruptions that shoot very thick and pasty lava into the air along with bursts of steam and gas. Strombolian eruptions usually produce little or no lava. Because of this the cones that are produced by this type of eruption is a very steep sided cone called a cinder cone. The photo shows a strombolian eruption taking place from a cinder cone. Cinder cones get their name from the material that forms them, cinders. 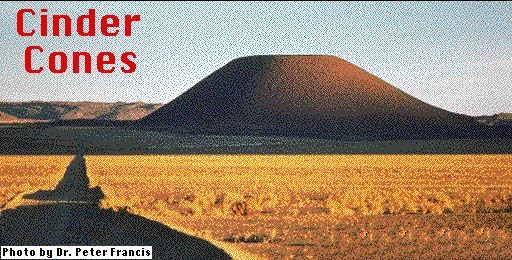 Cinder cones are the simplest volcanic formation . They form from explosions of red, hot magma cinders and ash . These cinders and ash settle around the main vent and build a steep sided cone. Very little lava is erupted from a cinder cone. Cinder cones very rarely rise to more than 1,000 feet above the surrounding landscape. Cinder cones are known for their very violent, explosive, exciting eruptions. Paricutin in Mexico and Mt. Vesuvius in Italy are famous cinder cones. 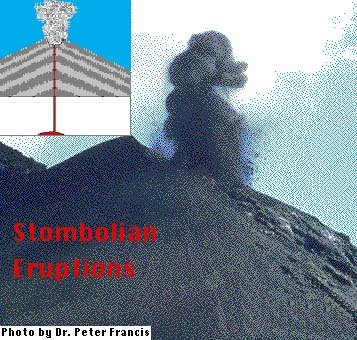 Vulcanian eruptions are more violent and explosive than strombolian eruptions. Vulcanian eruptions are named after the island of Vulcano off the coast of Italy. This is the same island that gave us the name "Volcano". Vulcanian eruptions contain high dark clouds of steam, ash, and gas. The ash plume builds a cauliflower shaped head and a thinner more treetrunk-like base. When the volcano quits erupting ash and gases it then ejects thick pasty lava. 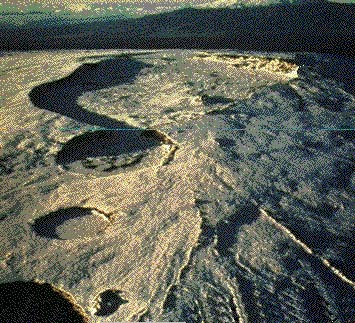 Vulcanian eruptions usually build a steep sided cone that is more symetrical than a cinder cone. This more symetrical cone is called a strovolcano. Vulcanian eruptions will send an ash plume to a height of 2 -9 miles. The photo to the left is of Katla volcano in Iceland which erupted in 1918. Stratovolcanoes or composite cones are formed from a combination of eruptions. First the volcano will have an explosive eruption that ejects huge amounts of steam, gas and ash. This will be followed by the ejection of lava. A large stratovolcano will be built with many layers of ash and lava. Stratovolcanoes are the most common type of volcanic cone. There are many famous stratovolcanoes in the world. Mt. St. Helens and Rainier in Washington, Mt. Fuji in Japan, Mt. Pinatubo in the Philippines, and Mt. Etna in Sicily are all examples of stratovolcanoes. The photo above is of the volcano Mayon, which is in the Philippines. 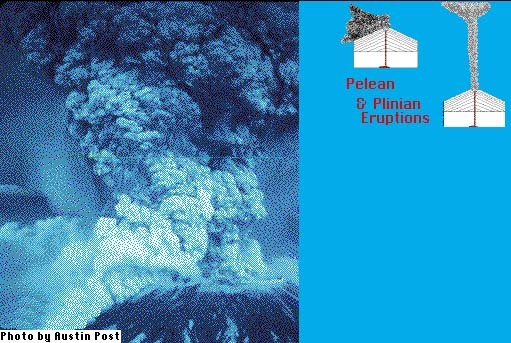 Pelean and Plinian eruptions are the most dangerous and explosive of the eruption types. 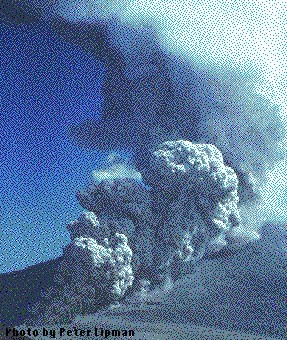 Pelean eruptions are named for the catastophic eruption on the island of Martinique in the Carribean Sea in 1902. The eruption and the pyroclastic flow that followed killed 29,000 people almost instantly. "Glowing clouds" of gas and ash flew down the mountain at over 70 miles per hour. The cloud was so full of ash that it was heavier than air and hugged the ground as it approached the coast. The temperatures were probably around 700 degress F. which would annihalate everything in its path. The only person to survive was a prisoner that was sentenced to death. The only reason he survived was that he was imprisoned in a very thick walled cell and the only door faced away from the explosion. Mt. Vesuvius, which erupted in 79 A.D. in Italy, was a classic Plinian eruption. Very hot ash falls killed thousands of people in the city of Pompei. Ash falls as high as 17 feet buried the city. Plinian eruptions were named for Pliny the Elder of Rome who died in one of the many eruptions of Vesuvius. The photo on the left side of this card shows Mt. St. Helens in its plinian eruption on May 18, 1980. The ash cloud rose to a height of over 50,000 feet. Write your answers to the questions on a sheet of paper. When you finish the lesson click on the "Earth" icon so that the next pair of students will be transported to the start of this lesson. Click on the page titles located directly under the questions to maneuver your way through the lesson to find the answers for the following questions. 1. Name the six eruption types and the three cone shapes. 3. Draw diagrams to represent the six eruption types. This lesson was adapted and modified from Dr. Stephen Mattox's, "A Guide to The Geology of Hawaii Volcanoes National Park". Do you remember that there are three ways that volcanoes can form? They form at subduction zones, mid-ocean ridges and at something called a hot spot . In this lesson you will learn about what causes hot spots to produce volcanoes. What do you notice about the lines of island groups in the Pacific Ocean? A geologist in the 1960's, by the name of Tuzo Wilson, noticed that there were straight lines of submarine volcanoes and volcanic islands in the Pacific. The active volcanoes in these chains are all located in the southeast corner and are the last island in that group. The oldest islands were the northern most islands in the group. Coincidence??? What Tuzo Wilson decided was that the Pacific plate was moving over three hot spots. 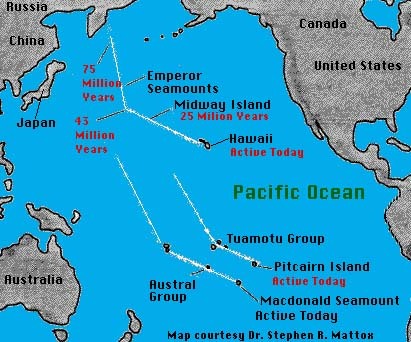 The Hawaii-Emperor Seamounts, Tuamotu, and the Austral groups of islands each formed over a different hot spot. 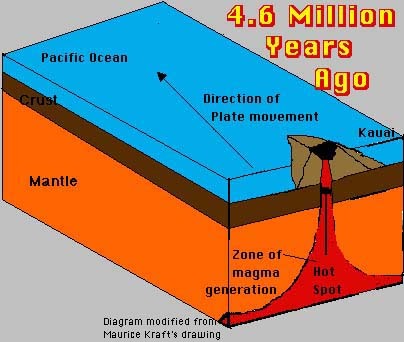 About 43 million years ago the Pacific plate shifted its path to a more northwesterly direction. All the island groups changed course at the same time!! He also concluded that all the islands in the Emperor Seamount- Hawaiian chain all formed over the same hot spot that is currently under the big island of Hawaii today. 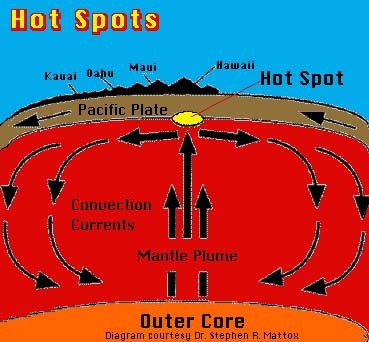 A hot spot occurs because of the intense heat of the outer core. This heat radiates through the mantle bringing hot solid rock upward to the hot spot. These areas of rising solid rock are called mantle plumes. Because of lower pressure in the upper region of the mantle the rock begins to melt. This forms magma which rises inch by inch until it reaches the surface forming a volcano. In 1971 W. Jason Morgan added to the hot spot theory. 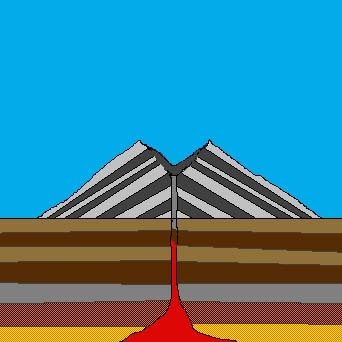 When the rising solid rock (mantle plume) reaches the plates it splits and spreads horizontally. This split or flow causes the plates to drift. Morgan proposed that there are 20 different hot spots in the world. Most hot spots are located at mid-ocean ridges, but there are a few located in the middle of plates, like Hawaii and Yellowstone. This is a map of the Hawaiian Islands today. They didn't always look like this. 4.6 million years ago there was only one island in this group. As the Pacific plate moved slowly northwesterly it produced the Hawaiian Islands, one at a time. 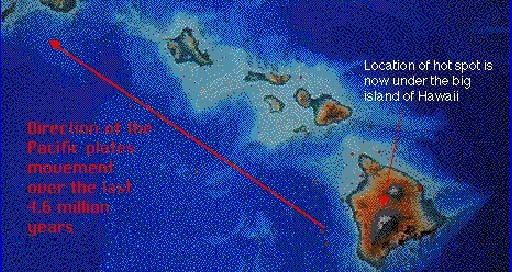 Today the big island of Hawaii sits over the same hot spot that produced the other islands. The first Hawaiian Island to form over the hot spot was Kauai. It began to break the surface of the Pacific Ocean about 4.6 million years ago. 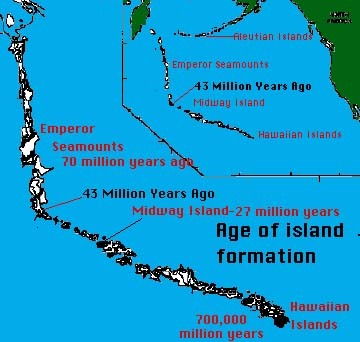 As the Pacific plate moved westward another island formed. That island was Oahu. The capital and largest city of Hawaii, Honolulu, is located on this extinct volcanic island. The islands of Oahu, Molokai, Lanai, and Maui share the same volcanic base. They all formed from separate volcanoes that were connected by huge lava flows. These volcanic islands also formed from the same hot spot. Today the Big Island of Hawaii sits over the hot spot and has the only active volcanoes in that island group. Konala, Hualaiai, Mauna Kea, Mauna Loa and Kilauea volcanoes have built the island over the last 500,000 years. Mauna Loa volcano is the largest volcano on Earth. It is over 30,000 feet tall from the seafloor where it was born to the summit, which is 13,684 feet above sea level. This is a caldera . A caldera is a large bowl-shaped crater that is formed by the collapse of a volcanic cone after an eruption . 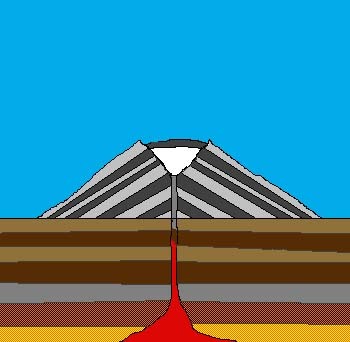 The animation shows the steps in the formation of a caldera. The volcano usually shows signs of erupting by producing earthquakes as the magma rises in the volcano. When you shake a can of soda pop and then open it, you will get a shower of gas (carbon Dioxide) and pop. Why? Because the pressure was much higher in the can than outside of the can. When you opened the top the pressure released very quickly shooting the gas and pop out. After a huge ejection of lava there may be no magma left in the chamber to fill the conduit and crater. When this happens there is a hollow space under the summit of the mountain where the magma used to be. The top of the mountain then collapses creating a caldera. The caldera may fill with water creating a lake. This is what happened at Crater Lake in Oregon. The ancient volcano Mount Mazama erupted violently about 6,000 years ago creating a caldera. The caldera slowly filled with snowmelt and rain forming beautiful Crater Lake. Another caldera forms most of the first national park of the United States, Yellowtone. The geysers and hot springs that make the park famous the world over are all volcanic in origin. In other word the park sits on top of an active volcano!!!! 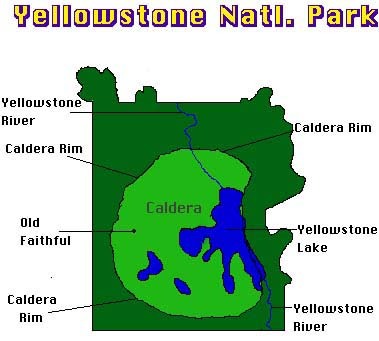 This is a map of Yellowstone National Park. Yellowstone sits atop a continental hot spot. As the North American plate moves steadily westward the hot spot affects different areas of the continent. Volcanic activity can be traced across the United States as the plate has moved across this hot spot. This caldera is one of the largest calderas in the world. It is over 65 miles across!! Millions of years ago the North American plate was hundreds of miles east of where it is today. As the plate moved west it slowly moved over the hot spot that is now under Yellowstone. The hot spot has created volcanic features through the western portion of the United States. Craters of the Moon National Monument in Idaho was created by the same hot spot. This is exactly the same process that formed the Hawaiian Islands. The North American plate continues to move, which means that millions of years from now the hot spot will be under South Dakota or Iowa!! Remember as you watch the animation, the hot spot is stationary and the North American plate is moving westward!!! 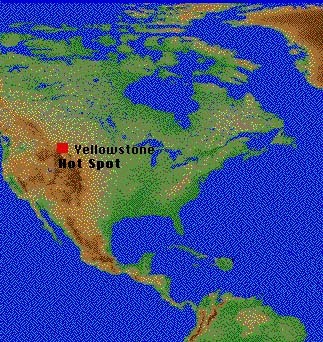 Today Yellowstone National Park sits directly over the hot spot. The volcano is quiet today, only the geysers and hot springs remind us that there is a huge volcano under the beautiful scenery. Only 600,000 years ago a huge eruption filled the area with lava flows. After the huge eruption there was a void under the top of the volcano. The weight of the volcano caused the top to come crashing down forming the large caldera in the park. Write the answers to the following questions in complete sentences on a piece of paper. Use the page titles located directly under the questions to navigate your way through the lesson to locate the answers. When you have finished the lesson click on the Earth icon so the next group can begin the lesson. 1. What is a Hot Spot? 2. How does and hot spot form? 3. How does a caldera form? Chapter #3 Copymaster includes tests and answers for students and teachers on material covered in Chapter 3. 1. What is lava ? 2. Name the two smallest particles of pyroclastic material. 3. Name the two largest particles of pyroclastic material. 4. What is a pyroclastic flow ? 5. What is the difference between pahoehoe and aa lava flows? 6. What is the difference between high and low viscosity magma ? 7. How does a lava tube form? 8. Name the two reasons that volcanic eruptions occur? 9-14. Draw the three volcanic cone shapes and label each. 15-16. What are the two most non-explosive eruption types? 17-18. What are the two most explosive eruption types? 19. What is a hot spot ? Use the term mantle plume in your definition. 20. What is a caldera ? 21. How does a caldera form? Lava is molten rock on the surface of the Earth. Name the two smallest particles of pyroclastic material. Dust is the smallest of the pyroclasts and ash is the second smallest. Name the two largest particles of pyroclastic material. What is a pyroclastic flow ? What is the difference between pahoehoe and aa lava flows? Aa lava flows are very rough and fragmented. They are blocky in their appearance. Aa usually flows at a high rate of speed and cools slowly. Pahoehoe usually flows at a very slow rate of speed. It is smooth and ropey in appearance. What is the difference between high and low viscosity magma ? High viscosity magma is very thick and pasty. It usually has a large amount of dissolved gas . It usually erupts violently. Low Viscosity magma is thin and runny with little dissolved gas. It usually erupts with thin flows of lava very quietly. 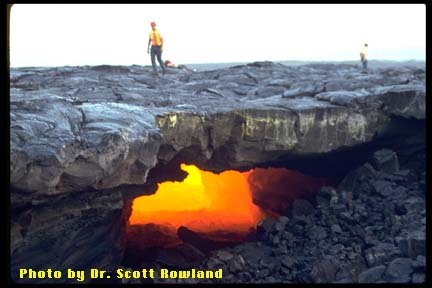 A lava tube forms a tunnel when the surface of the lava flow cools and hardens, while the interior keeps flowing through, draining away , leaving the interior hollow. Name the two reasons that volcanic eruptions occur? Icelandic and Hawaiian eruptions are the least explosive and dangerous of the eruption types. 17-18. 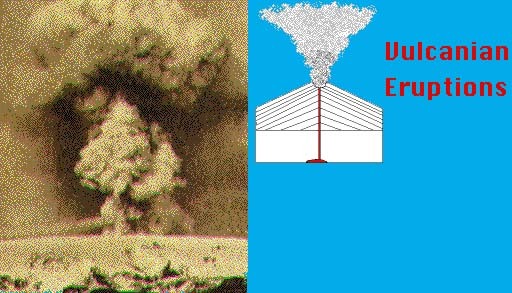 What are the two most explosiveeruption types? Plinian is the most explosive and Pelean is the deadliest. A caldera is a bowl-shaped depression caused by a volcanic eruption in which the top of the volcano collapses. A caldera will form when a volcanic eruption depletes the magma chamber causing a void under the volcano's summit. The weight of the top of the volcano causes it to collapse. A bowl-like depression or hole forms there. What caused the death of so many people during the second eruption of Vesuvius? Describe pahoehoe and aa lava flows. What is a pyroclast and how do they form? 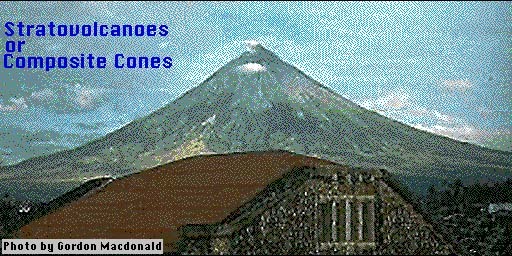 Lesson 8 "Volcanic Cones and Eruptions"
Name the six eruption types and the three cone shapes. Draw diagrams to represent the six eruption types. Lesson 9 "Hot Spots-Hawaii and Yellowstone"
How does and hot spot form? Pyroclastic flows of 700 degree ash , gas, and pyroclasts moving of around 70 miles per hour swept over the city killing over 20,000 people. A turbulent mixture of very hot gas, ash, and pyroclasts flowing down the side of a mountain at from 70 -200 miles per hour. Pahoehoe lava has a smooth and ropey texture. Pahoehoe forms when the lava flows at a slower speed, cooling slowly. Aa lava has a rough and fragmented surface. The lava forms when the lava flows at a fast speed, cooling quickly. Vesuvius "The Day it Rained Fire"
Pompeii and Herculaneum were bustling Roman cities in 79 A.D. Mt. Vesuvius hadn't erupted in over eight hundred years and the mountain was green with fig and olive trees. Farmers cultivated the sides of the cone. The people were used to earthquakes and didn't pay much attention to the numerous quakes that had been rattling their bowls and plates prior to the eruption . What they didn't know would kill thousands of people that beautiful August day in 79 A.D. Vesuvius was awakening from its long slumber. Vesuvius awakened with a huge eruption of ash and pumice raining down on the city of Pompeii. Pompeii lay to the south of the volcano and that day the wind was from the north pushing the cloud toward the city. Pompeii was buried in up to 20 feet of pumice and ash. Many animals and people were suffocated and buried alive. Many people though, did survive the initial eruption. Some decided to flee but many stayed. The city of Herculaneum lays to the west of the volcano and much closer to Vesuvius than Pompeii. Herculaneum was a beautiful beachside resort city in 79 A.D. Herculaneum was barely touched by the first eruption. 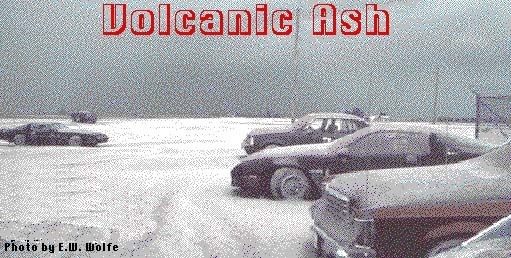 In fact, about only one inch of ash and pumice fell on the city during the first eruption. The next eruption was the deadly one. This eruption blanketed the whole surrounding area with very hot, turbulent, twirling gases and ash. This glowing cloud was very heavy and hugged the ground as it flowed down the side of Vesuvius. The temperatures of this pyroclastic flow were probably around 700 degrees F. and at a speed of over 70 miles per hour animals and people could not out run it. With temperatures this high everything in its path is killed instantly. Herculaneum didn't get lucky this time. It was buried in an extremely hot flood of volcanic mud. This steam filled volcanic mud buried the city with a layer over 50 feet high. Pompeii suffered through this eruption also. Over 20,000 citizens died in the pyroclastic flows only hours after the initial eruption. A man by the name of Pliny the Younger wrote an account of this eruption as he viewed Vesuvius from Naples to the northwest of the volcanic mountain. His account was probably the first one ever written. His uncle, Pliny the Elder, died in the second eruption that day. Pliny the Elder was a commander of a fleet of Roman battleships. He was also a naturalist, a person who studies natures spectacles and writes about them. He was viewing the eruption when he was probably over come by hot gases. Today Vesuvius is the most visited volcano in the world. The mountain that hadn't erupted in about eight hundred years has erupted many times since. In 1631, Vesuvius belched out another pyroclastic flow, which has been the worst eruption since 79 A.D. Many tourists pay to make the very difficult climb to the crater to view the steaming lava inside the volcano. They flock to the excavated ruins of Pompeii and Herculaneum to view the plaster casts of bodies as they lay when they died almost two thousand years ago during the day that rained fire. The students will place a small cork and a small steel ball into an empty glass jar. The students will then fill the jar with honey and watch what happens. They should write down their predictions as to what will happen after the honey is placed in the jar. The students should write down what they see occurring and why they believe it happened.. The students will observe that materials made of less dense material (cork) will rise in a much denser medium (honey). The steel ball will remain on the bottom of the jar because it is denser than the medium that it is in (honey). Magma will rise in the Earth for the same reason, the magma is produced by the melting of the oceanic crust and the top layer of the mantle . The melting material is less dense than the surrounding mantle and that causes it to rise. volcano cone shapes using modeling clay or playdough.
" 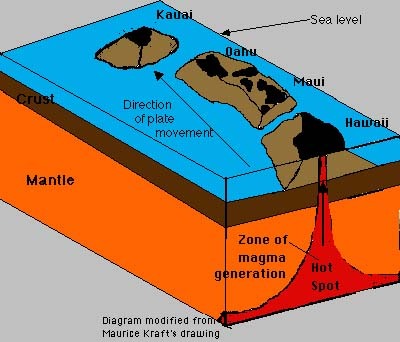 Hot Spot Volcanoes-Hawaii and Yellowstone"
cause mantle plumes to form and rise. The teacher must set up and run this experiment! The oil and dish will get hot!!!!! Pour the 4 cups of cooking oil into the glass dish. Place the glass dish onto the 2 clay bricks. Light the tea candle and place it under the glass dish. Put dark colored food coloring into the eyedropper. Squeeze some of the food coloring into the cooking oil near the bottom of the glass dish. When the food coloring begins to move lay some pieces of Styrofoam on top of the cooking oil and observe the movement. (The flowing of the Styrofoam will represent the movement of the Earth's plates) The cooking oil will heat up and convection currents will be generated. The food coloring will enable the students to see the movement of the convection currents. The oil and food coloring will rise as they heat up. The rising material will cool as it nears the surface of the liquid. The farther the material gets from the heat source the cooler it will become. As the material cools it will slowly desend. This process of gaining energy (heat) and rising and then losing energy (cooling) will go on and on. These are convection currents. This rising and cooling sets up a current in the cooking oil. The teacher should explain that this is a theory of how the mantle "flows" and the plates (Styrofoam pieces) of the Earth are carried with these movements. The students should draw and label a diagram of the experiment. Have the students fill a plastic squeeze bottle full of cooking oil with red food coloring in it. Place the squeeze bottle into a large clear plastic container full of water. Tell the students to squeeze slowly the bottle full of cooking oil. Have the students record what they observe. The students will observe the cooking oil rise through the water because the oil is less dense than the water. The same process causes magma in the Earth to rise from the bottom of the Mantle to the Earth's crust causing volcanism.